A slip of the tongue by Venezuelan president Nicolas Maduro that saw him muddle an iconic biblical reference by multiplying loaves and “penises” instead of loaves and fishes has set social media ablaze. The Spanish word for "penises" (penes) is just a letter away from the word for “fish” (peces) which may help to explain his gaffe. At the time he was outlining his plans to expand the country’s education program to a crowd at the Miranda stadium, in the country’s capital, Caracas. Dressed in an Adidas track suit in the bright red, blue and yellow colors of the Venezuelan flag, he said his government would "go in school by school, child by child, high school by high school, community by community — to embed ourselves in there. To multiply ourselves like Christ multiplied the penises — sorry, the fish — and the bread." His gaffe sparked a twitter storm with users quick to mock the Venezuelan leader who was elected in April, following the death of Hugo Chaves. "Panes + Peces = PENES #EpicFail@NicolasMaduro" wrote one user, LayNG. "Hahaha so I just read about Nicolas Maduro's speech and Christ did what?!?!? He multiplied "penises"?!?!? God bless!," wrote another, Sofy Cortez. 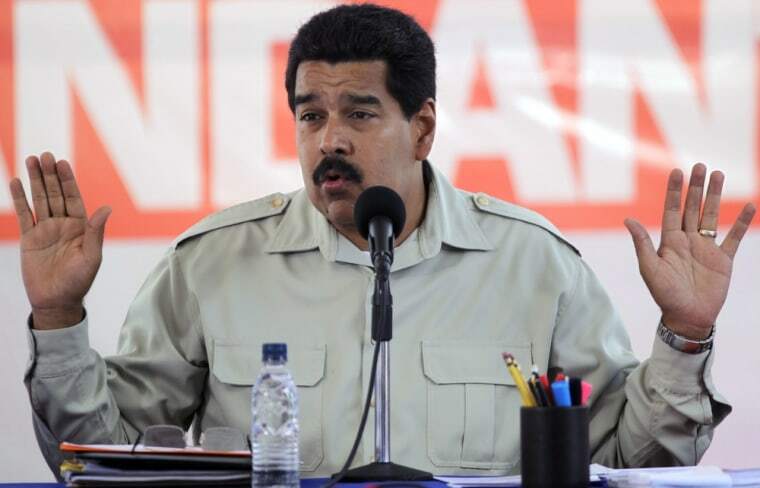 It marks the second time Maduro, has made a mistake during a speech, according to the Latin Times. On Aug. 10, Maduro incorrectly pronounced the Spanish word for "millions," making it a feminine noun instead of a masculine noun, the online publication reported. In Spanish, all nouns are assigned a gender. Under his rule the country has also suffered a toilet paper shortage.